To read more, please see the attached PDF. 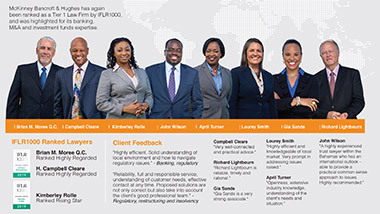 McKinney Bancroft & Hughes ranked Tier 1 Financial & Corporate Firm by IFLR100. 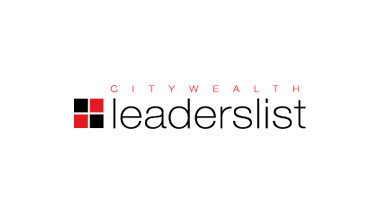 McKinney Bancroft & Hughes has again been ranked as a Tier 1 Law Firm by IFLR1000, and was highlighted for its banking, M&A and investment funds expertise. I was honoured to be asked to provide a short tribute to the late Chief Justice the Honourable Stephen Isaacs. I knew him for over 25 years and was deeply saddened by his untimely death. It is one of life’s cruel ironies that only a short time ago we were together at Government House celebrating his elevation to the substantive office of Chief Justice. Now, a mere two weeks or so later we are mourning his passing. It seems unfair but, to the faithful, we are left to remember the profundity of the opening eight verses of chapter 3 of Ecclesiastes and accept the providence of a sovereign God. Those of us who knew him will remember Chief Justice Isaacs as a thoroughly decent, humane, engaging, courteous, thoughtful and genuine man who served his country and his people for over 24 years as a competent, influential and accomplished jurist. He started his judicial career in 1994 as an Assistant Registrar of the Supreme Court and worked his way through the judiciary to become the highest judicial officer in our Commonwealth – The Chief Justice and head of the Judicature, the third branch of Government under the Constitution. Over 2,400 years ago Socrates gave his well known iconic description of the essential qualities of a good judge. He stated: “Four things belong to a judge: To hear courteously; to answer wisely; to consider soberly; and to decide impartially.” Chief Justice Isaacs demonstrated these qualities in the discharge of his judicial duties. In presiding at court hearings his demeanour was placid, his tone was cordial, his dealings with both counsel and litigant were respectful, his management of his court room was efficient and his control of the proceedings was firm, disciplined and temperate. Above all, he was fair in the sense of being open minded, impartial and independent. Judicial temperament has been described as reflecting “….patience, open-mindedness, courtesy, tact, courage, punctuality, firmness, understanding, compassion, humility and common sense.” The late Chief Justice Isaacs possessed all these traits as he went about carrying out the functions of his judicial office. At the funeral of Lord Cooke of Thorndon, one of the greatest New Zealand judges, it was said that “he was never flashy, never one to blow his own trumpet. 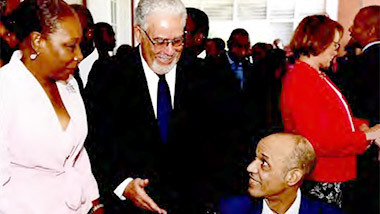 He believed he was part of a great movement……..He believed in practical justice that delivered fair and reasonable outcomes.” I cannot do better than to borrow those words to describe the late Stephen Isaacs. Chief Justice Isaacs had a commendable grasp of legal principles across a wide cross section of the law. He was grounded by an innate sense of fairness and justice which served him well as a judge. His well-developed understanding of the milieu in which he lived combined with his experience and working knowledge of the law were reflected in very sound judicial decisions. He adjusted seamlessly to the era of judge driven case management and because of his experience he adroitly managed a large volume of cases through the interlocutory stages to trial or earlier resolution. His record clearly demonstrates that when adjudicating cases he had no judicial timidity and applied the law as he saw it. I remember on one occasion when I discussed with Justice Isaacs, as he then was, the provocative tease from Lord Denning when he was delivering an after dinner speech in the presence of one of his fellow judges. Lord Denning said – “Unlike my brother judge here, who is concerned with law, I am concerned with justice.” Stephen identified with the point behind Lord Denning’s quip which reflected his innate sense of justice and the need to ensure that the law accomplished its ultimate goal of ‘doing right’ between the parties before the court. We have lost, all too soon, a notable, competent, experienced and respected Bahamian jurist who enhanced the public trust and confidence in our legal system. It has been stated that the Judge is the pillar of our entire judicial system. 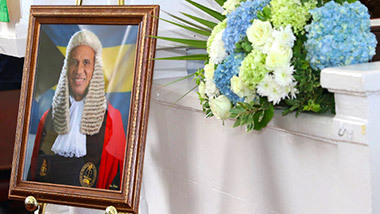 In that regard, Chief Justice Isaacs was a strong, reliable and steadfast pillar who significantly contributed to the preservation of the administration of justice in The Bahamas and the development of our jurisprudence. Our system is better off for his public service and we who knew Stephen Isaacs can learn from his quiet dignity, his temperate disposition, his passionate commitment to justice, his unfailing fairness, his humanity and his humility in wearing the privilege and power of high judicial office without ever succumbing to pomposity or arrogance. 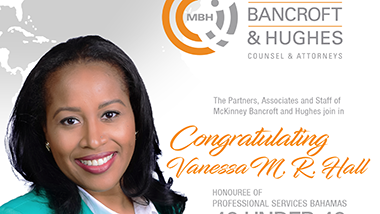 McKinney Bancroft and Hughes congratulates Vanessa M. R. Hall! 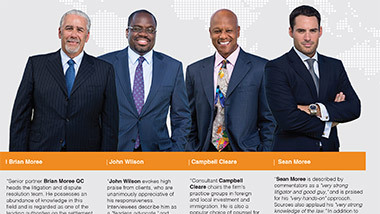 The Firm congratulates Vanessa M. R. Hall! Please see the PDF for our congratulations to Vanessa M. R. Hall on being an Honouree of Professional Services Bahamas 40 under 40. McKinney, Bancroft and Hughes mourns the passing of the Hon. Stephen G. Isaacs, Chief Justice of the Commonwealth of The Bahamas. We wish to extend our heartfelt condolences to the family and friends of the Chief Justice along with the entire legal community. McKinney, Bancroft and Hughes thanks the Hon. Stephen G. Isaacs, Chief Justice of the Commonwealth of The Bahamas for his years of dedication and service in the legal community and wish to recognize his illustrious career. His legacy will be remembered forever. 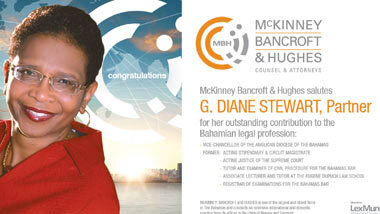 Mckinney Bancroft and Hughes salutes G. Diane Stewart for outstanding contribution to the Bahamian legal profession. 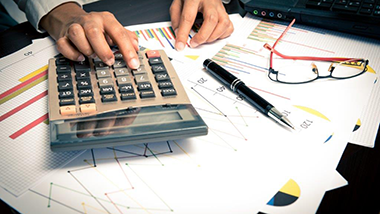 Pursuant to the Value Added Tax Act, 2014, which came into force in the Commonwealth of The Bahamas on January 1, 2015, legal fees and disbursements incurred in a matter or transaction are either exempt or subject to a value added tax (VAT) chargeable at a zero percent rate (0%) or at a standard rate. Pursuant to the Value Added Tax (Amendment) Act, 2018, effective July 1, 2018 the standard rate has increased from seven and one half per cent (7.5%) to twelve percent (12%). VAT is added to our invoices for legal fees and disbursements at the applicable rate unless the services and disbursements are exempt. For any queries you may have in this regard, please contact Mr. Adrian Edgecombe, CA at afedgecombe@mckinney.com.bs. Happy 45th Bahamian Independence Bahamas! 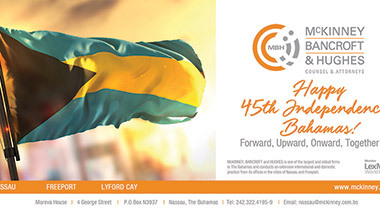 McKinney, Bancroft and Hughes wishes our Bahamian families, friends and clients a Happy 45th Independence! We welcome a new Associate, Ms. Knijah Knowles! McKinney, Bancroft & Hughes is delighted to welcome Ms. Knijah Knowles to the Family! Knijah is a graduate of the UWI Cave Hill Campus and the Eugene Dupuch Law School; having attained a Bsc Economics & Law, LLB and CLE respectively. 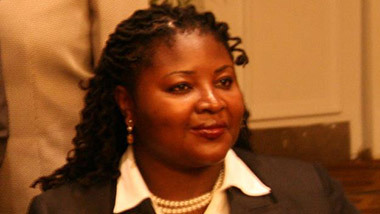 Since completing her law studies in 2012 Knijah has worked as the first Judicial Research Counsel to the President and Justices of the Court of Appeal and as Legal Officer to the President of the Caribbean Court of Justice. While at University, Knijah developed an interest in public interest litigation, particularly the intersection between gender rights and the law; publishing on both topics in the Cave Hill and West Indian Law Journal respectively. Knijah endeavors to live her life by the Rotary motto of “service above self”. She is a member of the Rotary Club of Nassau Sunrise, the UWI Rights Advocacy Project, a Board member with the Bahamas Crisis Centre and a Tutor with Project Read Bahamas.